This die easily cuts a beautiful flying dove. Perfect for holiday appliqu? 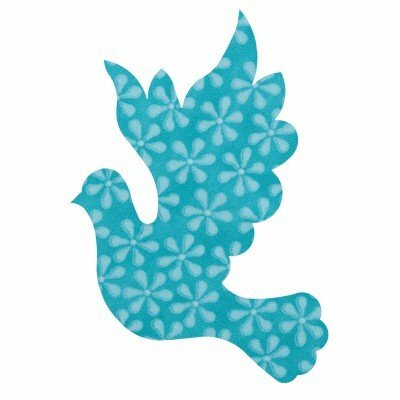 quilts, garments, gift tags and home d?cor, or use as the feature of a peace-themed quilt. Care & Maintenance: Use adhesive roller to clean lint and thread from dies. After each use, with the die pick provided with the cutter, remove any threads embedded between blades and foam. It's normal for threads to get caught where blades meet in a die. Remove with tweezers or die pick. Die blades never need to be sharpened. * Reproduction or use of licensed die shapes to make pre-cut kits (cut shapes); or to reproduce in a digital format (i.e., for embroidery, EQ, etc. ); or to reproduce in a printable format for personal use is permissible. Commercial reproduction or use of licensed die shapes for resale in a digital format (i.e., for embroidery products, etc. ), printable (i.e., patterns and books), or similar, without designer's permission is strictly prohibited. In other words, you need to seek designer's permission to reproduce shapes for commercial use.